Want to pass difficult courses? Or even ace them? The PASS program is here to help! PASS stands for Peers-Assisting Student Success – weekly group-learning sessions for difficult courses which are facilitated by a "PASS leader", that is, a student who has completed the respective course in a previous term with an A or A+. 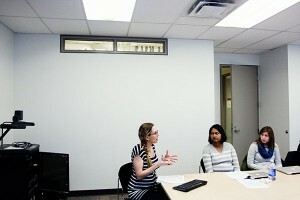 For BCOM, BHRM, and ITEC students at York University, these PASS sessions are organized by New College. In the past, PASS sessions have been offered for ADMS 2320, ADMS 2500, ADMS 2510, ADMS 3330, ADMS 3530, ADMS 3585, HRM 3420, and ITEC 1620. They are normally held through the Fall and Winter term and take place in the Atkinson building. Why should you attend PASS sessions? It's free of charge, and you can attend as many times as you want. Smaller study groups led by an A/A+ student, preparing you for the exams. Adapted each term from the current course outline. For some courses, there are two sessions a week, to give you more options. Improve your grade: 86% of PASS attendants surveyed after the term said that attending the PASS sessions improved their grade. Their median estimate of this improvement is 10 percentage points of the overall course grade. High student satisfaction: 49% of PASS attendants rate the PASS sessions as being "extremely helpful", another 39% as being "very helpful". Avoid leaving studying to the last minute. Feel more comfortable asking questions in a smaller group. Handouts will be given out at the PASS sessions only. You have to be in attendance to receive a copy. Want to become a PASS leader? See how you can become a PASS leader.